While I’m in for the Giants games and have anxiously followed their tortuously successful progression to this point, this embarrassment of recent riches has me feeling a bit like one of those twenty-six year-old frat boy Yankees fans I’ve run in to on this coast. They go around bragging on twenty-seven world titles even though they’ve only been alive for five of them. The difference here is that the Giants have only won one World Series in their fifty-three seasons in San Francisco and I saw it happen. Now they have another shot with Season 54. Some faces from 2010 remain but the narrative has shifted. Shut-down ace Tim Lincecum isn’t quite so shut-down this season and bearded closer and Beach Boy namesake Brian Wilson hasn’t closed anything since early April. Marina Triangle area bars are devoid of now retired legendary swordsman Pat Burrell. His buddy Aubrey Huff is still on the roster but prone to disability with every ground ball legged or panic attack suffered. New story lines have emerged including that of a thirty-six year-old Venezuelan second baseman acquired late-season from the Colorado Rockies. 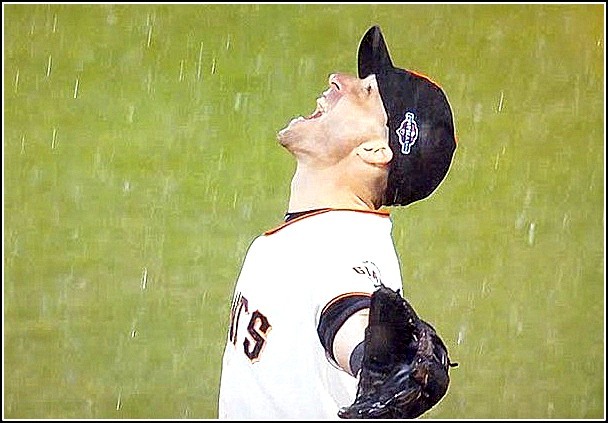 Marco Scutaro is the latest in a string of normal-sized sensations including Lincecum and Sergio Romo who remind us that in baseball you don’t need a head the size of Barry Bonds’ to do spectacular things. (With deference of course to Bruce Bochy, whose natural-grown bean makes even Bonds look like a pinhead.) Center fielder Angel Pagan, taken from the Mets, has (as my buddy Tom Myers points out) one of the great “duality-of-man” names of all time and even looks like a Satan worshiper. Shortstop Brandon Crawford’s facial hair is reminiscent of Michael J Fox mid-transition in Teen Wolf. And crazy-eyed right fielder Hunter Pence, while capable of making the play, possesses a fluidity of motion that makes Jerry Lewis look like Usain Bolt running the hundred meter dash. But as they say in baseball, just get there and anything can happen. The Giants have a single day of rest to recover from the six elimination games they encountered in the playoffs and get ready for the latest Greatest Pitcher of All-Time, Detroit’s Justin Verlander. The Tigers clinched early enough playing the Yankees to take a cruise, get their Christmas shopping done, and play a half-dozen inter-squad practice games. It’s looking like Barry Zito will be taking the hill for San Francisco after the Giants used their two strongest bets in Vogelsong and Cain to close out the St Louis series. Zito signed a $126 million contract in December of 2006 that has become synonymous with poorly-conceived executive decisions and that led to managing partner Peter MacGowan stepping down from his post. He redeemed himself somewhat in 2012 but lasted only a few innings in his first playoff start against the Reds. Then something peculiar happened last Friday with the Giants down three games to one in St Louis. The handsome but often beleaguered Zito, looking slightly fuller-faced and older, got out of an impossibly tight jam with no outs and runners on second and third in the second inning. He then proceeded to pitch in to the eighth, painting the corners with a masterful selection of balls varying in both speed and movement. He won the game and, with Vogelsong, set the stage for last night and the Giants celebrating their second pennant since 2010 in a joyous late-October San Francisco downpour. It would seem enough to instill one with that rarest and most elusive of perspectives, hope. Or you could conclude that things are going too good and stop taking phone calls from Cary Grant. Regardless of chosen outlooks two facts remain: there’s more baseball to be played and it’s a welcome distraction from the ongoing and off-putting political circus. Go Giants. This was written by admin. Posted on Tuesday, October 23, 2012, at 12:25 pm. Filed under Posting. Bookmark the permalink. Follow comments here with the RSS feed. Post a comment or leave a trackback. Thanks for the shout out, Rick…I will miss much of the game as it is my 20th anniversary tonight, (just so you can date where you were 20 years ago today), so we can go out an ah celebrate, talk about the duality of man….this things not public right?